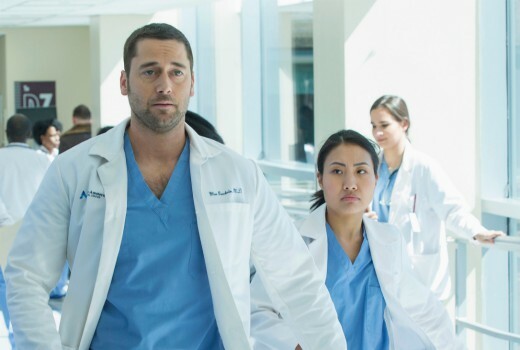 “How can I help you?” is the default position of the very expedient Dr. Max Goodwin (Ryan Eggold) who becomes the new medical director at America’s oldest public hospital, New Amsterdam. This New York hospital is bustling with staff and patients and breaking at the seams, but Max has an unconventional way of fixing things: he fires the entire cardio surgery department, accusing them of over-billing. It gets him the attention that he means business. But it also sees him collide with those around him including the sultry chief of oncology, Dr. Helen Sharpe (Frema Agyeman) who seems more interested in appearances on Ellen & Oprah than her job. Then there is his wife, who is due to give birth in 12 weeks, and who sees very little of her workaholic husband. Being a medical drama there are more than a few patient subplots here to keep things moving, including the Liberian teenager who may just have the ebola virus, a mother who is resuscitated after being declared dead and a foster care girl who has been abused at home. The ensemble sees these cases handled by Dr. Lauren Bloom (Janet Montgomery), who is pursuing a reluctant Dr. Floyd Reynolds (Jocko Sims) and psychiatrist Dr. Iggy Frome (Tyler Labine). The series by David Schulner is based on a book Twelve Patients: Life and Death at Bellevue Hospital by Eric Manheimer and at its best, in the hands of Aussie director Kate Dennis, it manages to juxtapose personal dilemmas with the professional. There is a fleeting reference too to the cruelties of Trump’s border policy. Ryan Eggold from The Blacklist amply fits the heroic male lead (and looking a lot like Matthew Fox), but he is so rapid-fire with some of his dialogue you’d almost welcome subtitles. It’s a pleasure to see Freema Agyeman (Doctor Who) back on screen, while Janet Montgomery will win fans early on. No question this is a crowded genre where the likes of ER and Grey’s Anatomy stand tall, but New Amsterdam arrives with confidence without overdoing the melodrama that usually accompanies such tales. Worth a look. New Amsterdam airs 9pm Wednesday on Nine. Reading your review….I will try it out….thanks. OMG…I so love this show….just keeps getting better! I like Ryan Eggold. I first saw him in the rebooted 90210 where he played a teacher (not much older than those playing the students) he bulked up on The Blacklist and just looks better as he gets older. I’m not big on medical dramas, but will check this out because of its star. When he was on 90210 , he was actually younger than one of the actors playing the students eg Liam was 1 year older. Thanks for the review David, will have a look at it. I see it is on Wednesday and Thursday nights this week.